Our London canning event is now just days away. There are a few tickets still remaining so you still have the opportunity to learn about canning and bottling, how to stock your own pantry and then make fabulous meals inspired by your glorious comestibles. To book your ticket, follow the link here. I will be bringing along an assortment of my own preserves, pickles and relishes so we can enjoy matching flavours and coming up with the perfect combinations. Kerstin and I will be preparing a banquet from jars. I would love you to be as inspired by food in jars as I am. More information about canning and the event in my last blog post here. I’ve been a keen jam maker for donkeys years. Since I was 20, it’s been rare that a summer has passed by without a batch of strawberry or damson jam reaching setting point in my little kitchen. I love the tradition and never tire of celebrating the berry season each year. A few years ago I started **canning and learnt of a life beyond … jam. Jam is lovely, and all that, and I’m still jam making with avengeance, but once you know how to can or bottle stuff in jars, it opens up another preserving dimension altogether. 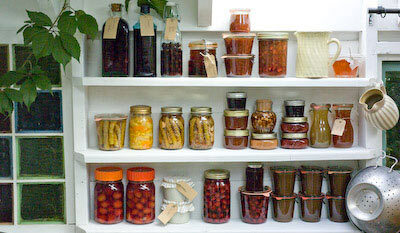 I now ‘put up’ all kinds of compotes, purees, pie fillings, cordials, syrups and ketchups. Sometimes I preserve fruit without any added sugar at all so my beautiful jarred comestibles become potential ingredients ready to turn into dishes, desserts and baked goods later down the line. More recently I’ve begun pressure canning vegetable soup and pulses made with homegrown vegetables from the plot. **Canning or bottling enables produce in jars to be processed in such a way that the contents will become sterilised and so keep for a year or more safely unopened. The process involves immersing the filled jars in a boiling water bath or heating them under pressure using a special pressure canner. The correct technique called for depends on the acidity or alkalinity of the ingredients. At first my ambition was to fill the shelves. A well stocked pantry or store cupboard is a thing of beauty with a real feelgood factor and the added advantage a ready supply of comestibles means you wont starve. So I filled the shelves with colourful and flavour-filled jars in tidy ordered rows till there was hardly room to fit more, all very satisfying. 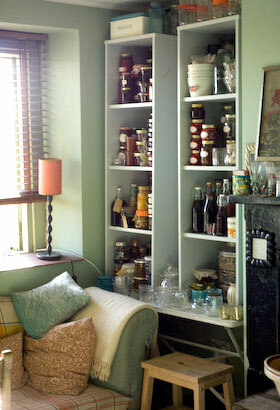 Then I realised the turnaround, opening jars and using up the contents, was the next vital part of the job. The scraping sound as the spoon scoops the last morsels from the sides of the jar has become music to my ears. Oh yes, an empty jar offers another opportunity, to be refilled with something even more delicious. And so the cycle continues. I’m on a voyage of discovery to find the preserves I adore and can’t get enough of. I don’t want anything nondescript taking up valuable shelf space in my house. Bottling fruit was once a common activity in the UK, especially during wartimes until freezing food became the easier option. Once every household had a freezer, bottling was seen as to much of a faff, all but one of the companies in the UK making the necessary equipment died a death and only a handful of diehard allotmenteers and make do and menders managed to keep the craft alive. I too own a freezer and it is filled to busting with stuff I generally forget about. I have realised that if I freeze some homegrown veg, all the while it languishes in the freezer it is clocking up additional cost. It is an expense most of us are quite prepared to accept, but with utility bills rapidly on the rise, these considerations become more relevant. Those bargain beans will have cost a fair bit more by the time I use them, that’s if I remember to use them at all of course. Alternatively, the joy of jars on shelves means once bottled the food doesn’t cost a penny more or require defrosting either. Pop open the jar and it’s ready to go. It is surely time to revive this culinary craft and give a big tick for sustainability. With months of rain over the summer, 2012 was a difficult one for growing fruit and veg here in the UK. For a couple of weeks in July a freak strawberry glut meant strawberries were on sale at a bargain price, juicy, flavourful local strawberries. I bought loads and bottled them. They have been my favourite and most useful preserve of the year and they’ve been eaten with yogurt, rice pudding, cake … just about anything. Now down to my last couple of jars and hoping such good fortune is to be found this summer for a repeat performance. 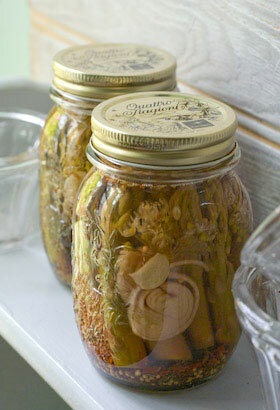 Canning means you can make the most of bargain-priced ingredients when they come your way. 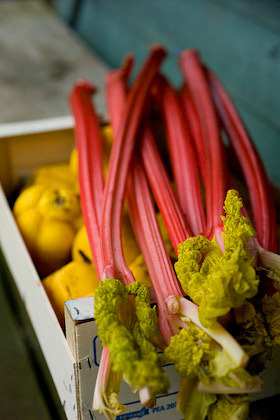 I gave my recipe for rhubarb ketchup a couple of years ago and it has been a big hit with everyone who has tried it. I like to add it to my vegetarian cottage pie. I grow rhubarb anyway, so is generally in plentiful supply and I try to make enough ketchup to see me through the year. This is a good one for people with savoury tastes too. Stocking up with cordials is when canning makes such sense. You can make combinations you will never see for sale anywhere and quince blood orange and coriander definitely fits that category. (For this fabulous recipe see my top-notch canning chum Shae’s blog – Hitchhiking to Heaven) Can be given added sparkle or served flat, scope is endless for a non-alcoholic tipple or as part of more potent cocktails. Though the canning cycle naturally runs over 12 months, some people like to stock up for longer in case next year their tomato crop is destroyed by blight or unpredictable spring weather ruins the quince harvest that should rightfully follow. 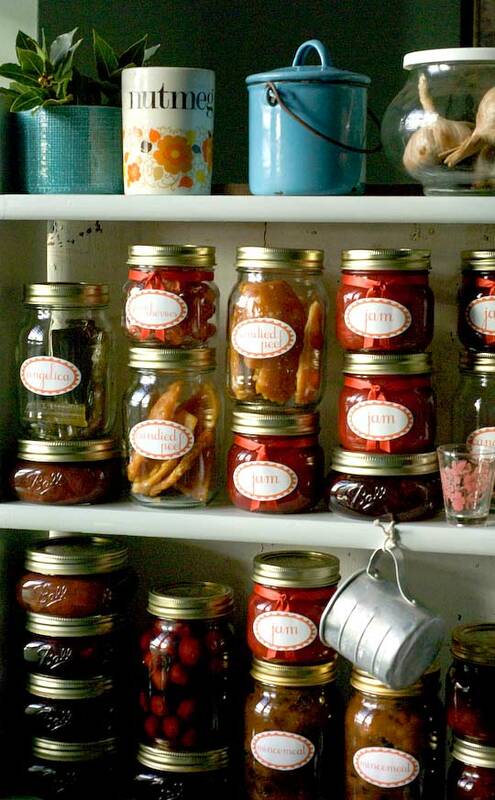 Most produce if bottled and stored correctly will stay good for a year or two. 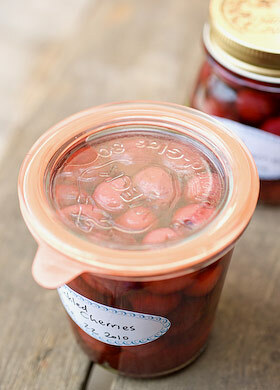 I’ve got a couple of jars of morello cherries bottled in 2011, still delicious and destined to become clafoutis. Fingers crossed the local cherry harvest is bountiful this summer so I can stock up again. It is always so much easier to have someone who knows what they are doing to show you the ropes. 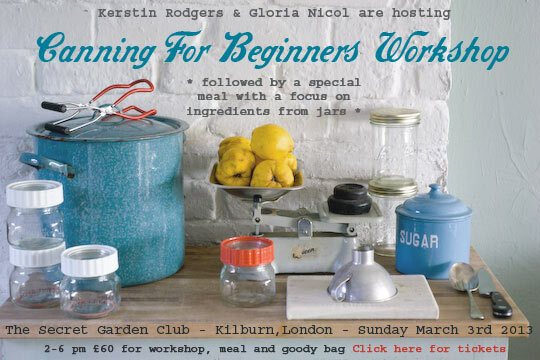 Kerstin Rodgers (aka Ms Marmite Lover) has invited me to run a special canning class on 3rd March 2013 starting at 2pm, as part of The Secret Garden Club at her The Underground Restaurant, in North London, followed by a special supper focusing on food from jars. At Canning for Beginners, you will learn all you need to know to get started; Which ingredients call for what approach, a basic sequence to follow every time you prepare your jars, how to water process high acid ingredients and a brief introduction to pressure canning for low acid ingredients and what you need to consider to keep your canning safe. We will cover the best jars to use, how they work and what tools and equipment you will need and I will be advising on the best sources for specialist bits and pieces that are harder to find. After bottling some fruit compote to take home, there will be a meal based around preserved ingredients. 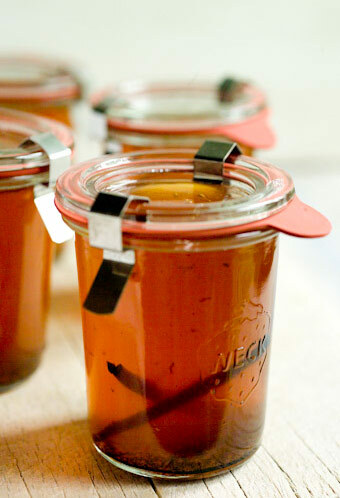 Be prepared to be surprised by just how wonderful the flavours of preserved foods can be. Selection of Cheeses and individual hand pies with an abundance of pickles and relishes to go with and sample. The pickles and relishes to include jarred garlic scapes, black grape chilli jam, pickled golden beetroot with onion, rhubarb ketchup, pickled greengages, etc. Little Cardamon or almond puddings baked in vintage French jars served with pear vanilla compote or roasted rhubarb and clotted cream. Damson mincemeat and Bramley apple jalousie served with ginger syrup cream. You will leave with a goody bag to take home containing a preserving jar, a pair of jar lifters and a list of useful resources as well as my suggested reading list so you feel ready to go off and stock your own pantry with wonderful things. The event is by ticket only and there are limited places available. To reserve you place book here.